George Osborne, the Chancellor of the Exchequer of the British government, the person in whom we have entrusted the economy of Great Britain, is being irresponsibly with respect to looking after his family cat: Freya – a tubby tabby. Some people might say that he is being irresponsible with the lives of British citizens too. I don’t want to receive a comment (fat chance) from him saying his wife looks after the cat. A cat is a family responsibility. His wife looks very fragrant but, clearly, fragrance does not translate to good cat caretaking. George works from No 11 Downing Street and lives there, too, as far as I am aware. 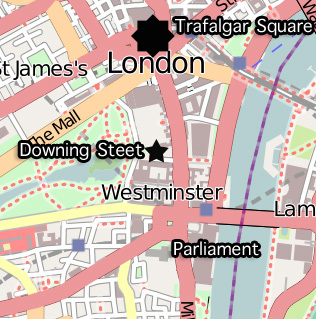 To visitors not living in the UK, Downing Street is a very central location in London, close to the Thames and near the Houses of Parliament. Freya is fat. OK, that is not unusual but it does demonstrate a careless approach to cat caretaking. Far worse is the fact that Freya is allowed to wander around central London. Allowing a cat to roam is fine if the place where you live is reasonably safe from a cat’s perspective but central London? No. There is nothing but masses of dense traffic and Freya seems to be amongst it from time to time or a lot. Freya has been seen in a public house (“pub”) on the other side of Whitehall. Whitehall is a busy and wide road that connects to Downing Street. She’ll have to cross it to get to the pub and journey fraught with danger. Freya has also been seen in Trafalgar Square! Now, that is extraordinary. Trafalgar Square is at the end of Whitehall. It is about 800 metres from Downing Street and the traffic is awesome all along the route and at Trafalgar Square, unless Freya finds some fancy way to get there that avoids traffic. The conclusion must be that the Osborne family are allowing their cat to roam widely in a place that is totally unsuited to it. Some cats are great at avoiding cars and lorries. They even learn to look and check but they are not that expert at it and eventually an accident is liable to happen, especially in the places around Downing Street. Having personally strolled around this exclusive and densely populated tourist locality of London i find it amazing for “Freya” to have survived her walks across the road.The traffic is constantly on the move unlike other more secluded localities of London.Stray cats are accustomed to crossing roads but not domesticated cats that are accustomed to the comforts of a house or garden. Michael, when you say that she looks “fagrant,” did you mean flagrant? I think –I have not seen her picture–but I think that her hubbie sounds flagrant. Who knows why she married him. I don’t pay attention to such speculations, but! from my understanding of marriages in gov’t here, she: 1)loved him from before his position in gov’t, and she no longer has a say in “household” affairs, or, 2)she married him for prestige and fame. Who am I to say, esp. being from the states (not to mention naive). I got her mixed up with the Clegg’s wife 😉 I don’t remember what Osborne’s wife looks like. Senior moment — again. I have just seen a picture of George Osborne’s wife and she is quite fragrant but not as fragrant as Clegg’s wife. “Fragrant” was used by a judge to describe Mary Archer the wife of Jeffrey Archer the author. Mary Archer is very attractive and well turned out. But still, why, when he, when they–is the gov’t. that disjointed? Doesn’t surprise me, but at least declawing of cats is banned. How did that come about, may I? How could even their media voice allow gov’t representative?/administrative feline to be walking the streets? Well, I think it is bad public relations for the government never mind the safety issues for Freya. Declawing is not banned per se. We never did it. It never entered our heads to declaw cats. The law (Animal Welfare Act 2006) bans animal cruelty and declawing happens to fall into that category and so it is a crime and it is banned. But there is no law that says “declawing is banned”. It comes under unnecessary cosmetic surgery I think like tail docking and ear cropping of dogs. Most people here haven’t even heard of declawing. One of our nieces who lives in London is married to an American and when they visited relatives over there she was horrified to see declawed cats. The person they belonged to couldn’t understand why anyone would want cats with claws! Unbelieveable to us that anyone would want to take a cat’s claws away. lol.. that whole comment was hilarious. You know, just a note, if feel uncomfortable commenting on this as I have let my cat get out of my sight while gardening (just about three wks after moving in to the new property); still, I don’t understand, why would a media-worthy mongrel let his cat wander around outside, let alone in a busy traffic-area? Is he really that insensitive to animals. Sounds very much like he is. His government role…wow. Such insensitivity. And especially to “his” cat? Disgraceful. Please fill me in as to “Tory Toff” and “larry?” I don’t understand these terms, being from the States –btw, hopefully, with enough letters and petitions to our reps, we WILL get declawing declared illegal. Hi Caroline. Tory = conservative = republican and “toff” = posh = upper class = rich that sort of thing. Osborne is rich as well as being a politician as his family own the well know (in England) company “Osborne & Little” that make household furnishings. No 11 Downing Street must have a garden at the back and they’ll have another home somewhere. It just seems they have a lot of options for looking after Freya that are better and safer. Why feel uncomfortable Caroline, if you live in a safe cat friendly place like we do there’s no reason to keep your cat a prisoner. All cats should be able to be free to enjoy the life they were born for but people have made parts of the world too dangerous and if we lived in that part of London with heavy traffic we wouldn’t be able to let our cats roam as they can here. But there is no law in the UK, the Pet Welfare Act doesn’t say cats must be kept in, they have ‘a roaming commission’ here. It’s just a matter of common sense really of which Osborne has zero….like the rest of the government we have …for example there are millions of young unemployed people for lack of jobs so what do they do? Only put the retiring age up to 66 so that older people have to work until they drop while young ones live on benefits, then make it that 35 years will be enough contributions paid in for a state pension while people like my sister will have paid in 50+ by she’s allowed to retire. Ooooh don’t get me started about this government we ordinary people didn’t elect, but we have to suffer because of those who did let them in! It seems to be much the same here, my mother is seventy three and is still working full-time–no retirement in sight. This is so wrong. Caroline Larry is the cat nextdoor which is the house of the Primeminister of England. They got him to keep the mouse situation under control. Freya lives nextdoor has been known to squabble with Larry who is a bit on the lazy side. I saw a photo of her slapping Larry. You are right that just the fact of being in government they should take care of what example they set in regard to their cat. Both Larry and Freya are allowed out. Freya likes to wander more though and has once been lost. She is microchipped luckily. However thats not all, London is a ridiculously dangerous place for a cat, especially arounnd that area so that’s the real and most obvious reason neither cat should be allowed anywhere except, ideally, and enclosed garden at the back. If it were not so dangerous then it would be fine to let them out. Ideally every cat should be able to spend lots of time outside. Agreed. Wherever possible cats should be allowed to experience the smell of grass and earth and the air and to feel it under their feet. I’ve heard Freya slaps Larry around. This is awful. If she gets hit by a car it will be in the news and bring the whole thing of safety to light. Freya is well known. I hope she never gets hit. She got lost when living in Notting Hill gate before moving to Downing St. She showed up at a shelter and was then sent to Downing St – her new home – because in the time she was lost the Osbournes moved. Freya slaps Larry around. Not good. I am astonished the family allows this in Downing Street of all places. There has to be a limit to letting domestic cats roam. The limit depends on where you are. George Osborne 🙁 I can’t stand the man 🙁 sounds about as good at looking after Freya as he is at looking after our economy….totally useless! To let a cat wander around amongst traffic is very irresponsible, I hope she stays safe. I agree that people who like cats can’t be bad but not everyone who keeps a cat is a cat lover. Downing Street is the worst place in England from which to let your cat wander. There is some grass at the back at St. James’s Park, but Freya is walking down busy roads. It is a shame. Perhaps she will be be OK but it looks bad.